Making games, one yard at a time. A blog by game designer and writer Paul Stefko. The 150-point occupational template represents your role on the ship. The commander is the leader and spokesperson for a Space Patrol vessel. Note on Rank: The campaign uses GURPS Social Engineering: Pulling Rank, replacing the Patron advantage with rules for calling in support based on Rank. The Commander starts with Patrol Rank 1, while all the other occupational templates have Patrol Rank 0 as a minimum. No character can begin the campaign with higher than Patrol Rank 4 (making them a Lieutenant Commander). In my prospective GURPS Space Patrol game, characters are built by choosing an occupational template (worth 150 points) that determines your specialty in the crew and a dramatic template (worth 50 points) that establishes your role in the fiction. This set-up was directly inspired by GURPS Template Toolkit 1: Characters, and the templates are built using the advice found there. I know that nonhuman characters are a big part of the space opera that this campaign emulates. But rather than create a wordy but ultimately incomplete list of alien races, I chose instead to build a modular dramatic template that lets the player define their race at character creation. I give you the Alien. Playing Lite is a series presenting campaign frames that can be run using only GURPS Lite, available for free from Steve Jackson Games. In this campaign frame, players take the roles of Merry Men, followers of the outlaw Robin of Sherwood. As the campaign begins, the PCs receive word that Robin has been captured by the Sheriff of Nottingham and will be hanged. It is up to the Merry Men to rescue him. The first adventure consists of the PCs infiltrating the castle, fighting their way past guards, and reaching the tower where Robin is held. When they arrive there, however, they discover that Robin has already been executed. The Merry Men then make a narrow escape and retreat to Sherwood. Each member of the Space Patrol is issued the following equipment. They are expected to wear their contacts, uniform, and communicator at all times while on duty. The multiscanner and ombiblaster are required for landing parties and security details. Communicator This touch-activated badge uses radio to communicate with a range of 5 miles (and can be read by a ship up to 500 miles away). Other equipment can network with the ship through this device. It includes basic encryption. $50, 0.05 lbs., 2A/10 hr. LC4. Hyperspectral Contact Lenses These lenses extend the wearer’s vision into the infrared and ultraviolet. They grant +3 to Vision rolls, Tracking rolls, and all rolls to spot hidden clues or objects with Forensics, Observation, or Search skill. These bonuses are not cumulative with other passive sensors or similar advantages. The lenses include a digital camera and can display the output of the standard uniform’s computer. $1,200, neg. weight. LC4. I have copious notes for a hypothetical GURPS Fourth Edition space patrol game I may or may not run some day. Here is how I would simplify the effects of gravity and space sickness. Note: I reference the G-Experience advantage below. In this campaign, G-Experience comes in only 2 levels. For 5 points, you have experience with a single gravity band as defined below. For 10 points, you have experience with all gravity bands. Gravity To simplify the effects of gravity, use the following gravity bands. The exact G values of each band are unimportant; the listed penalties and effects are average for the band. We had our first session of a new D&D 4th Edition game, and it went well, I feel. I have two players who are old hands at 4E and three who are basically brand new to the system (but not to gaming). The new players are catching on to the rules quickly, which was a worry with something as complex as 4th Edition, of course. Here are a pair of encounter maps I prepared for the first session of my new D&D 4th Edition game tonight. The party will be venturing through a swamp. The arrow-looking things are thick patches of plant matter that serve as difficult terrain. Blue marks the edges of deep standing water. 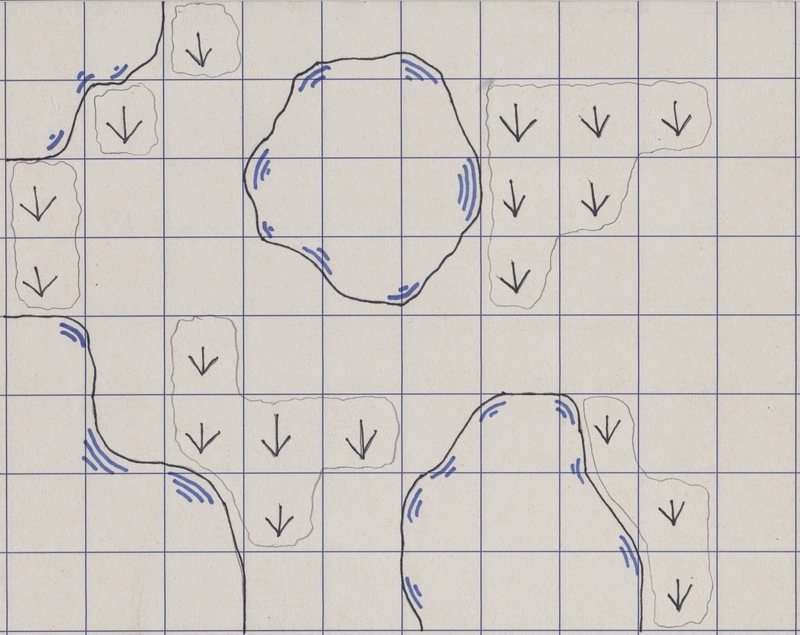 On this second map, the section in the middle is a log bridge covered in slippery moss (in green). The maps were hand-drawn on 8.5"x11" singles from Ennie-winning Gaming Paper. These ultra-tech drugs may be available as early as TL9. Patches are contact agents (effective in 5 minutes), inhalers are aerosols (effective immediately), injections are packaged in a disposable hypo (effective immediately), and sprays are aerosol contact agents (effective immediately). Aggresine: This combat drug increases adrenaline production, boosting reaction in dangerous situations but also causing severe antagonistic response. Grants Combat Reflexes and the subject must roll HT or also suffer Bad Temper (9). Lasts for ([25-HT]/4) hours per dose. Available as a patch, inhaler, or injection. $120 (patch or inhaler), $60 (injection), per dose. LC2. Anti-Fear: This drug suppresses fear response, granting the subject Fearlessness 4 for ([25-HT]/4) hours. Available as a pill or patch. $160 (patch), $80 (pill). LC3. The following computer systems were built using the rules in GURPS Ultra-Tech. Complexity and storage are for the listed TL. Prices do not include the price of necessary power cells, but weights do. Belt Computer (TL9): This heavy leather belt has a Small computer printed on the inside surface. The leather provides the computer DR 1. The computer can connect to interface devices (not included) via the built-in cable jack. The device is Complexity 3 and stores 10 GB. $100, 0.5 lbs., 2A/20 hr. LC4. Card Computer (TL 9): The size of a credit card, this is a common system for children. It has no built-in interface, but is designed to be slotted into terminals in public spaces like mall kiosks and school desks. Complexity 3, stores 1 TB. $100, 0.025 lbs. A/10 hr. LC4. Note: Snickers is written as a starting character for a GURPS Illuminati University game. Snickers is a TL12 Petbot modeled after a domestic house cat. Originally programmed as a domestic servant and companion, much of Snickers' memory has been wiped (probably in whatever event resulted in his appearance on the IOU campus). He was discovered wandering confusedly through the Pent late last Spring semester by two SPCA co-eds, who immediately started fighting over "OMG! What a cute kitty!" Thankfully, Snickers was able to escape in the ensuing catfight. He eventually made his way to Admissions. Seeing a talking cat walk in off the street, Admissions immediately had Snickers escorted to the ArchDean's office. The ArchDean, of course, recognized that Snickers wasn't one of her pets and indeed was not even native to our particular corner of the timeline and gave him a full scholarship. +TimeWatch RPG is an upcoming GUMSHOE system time travel game designed by +Kevin Kulp and published by +Pelgrane Press Ltd. Its Kickstarter campaign earlier this year raised over $105,000 and unlocked 50 stretch goals. Instigating Event: John Lennon is given information that Pete Best is the key to the Beatles’ future success, and he convinces Paul McCartney and George Harrison to keep Best in the band. Instead, friction between Best and the others breaks up the group within months. In a GURPS Monster Hunters game I ran, a biotech company was experimenting with giant hybrid species of Drosera, a carnivorous plant that shows promising nanotechnological applications. These plants attack the nearest creature within reach and attempt to grapple with their sticky tendrils. Victims are exposed to a powerful digestive that can eat through armor and flesh given enough time. Adhesive Tendrils (16): Grapple; Reach C,1. Adhesive adds +5 to effective ST. While grappled, victim takes 1d-2 corrosive damage each turn. Traits: Mindless Plant; Injury Tolerance (Homogenous); Vibration Sense (Air).